Use on non-porous interior and exterior applications. Works on residential, commercial and industrial applications, including bathrooms, basements, window frames, office buildings, factories and more. Kills existing mold, mildew and odor causing bacteria. Does not require extensive surface prep. 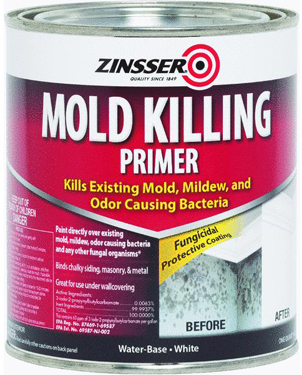 Paint directly over existing mold, mildew, odor causing bacteria and any other fungal matter. Binds chalky siding, masonry and metal. Great for use under any topcoat. Dries to touch in 30 minutes, top coat in 1 hour.